But, this year, I have started something different when it comes to the holidays. I am doing the holidays just like I intend to do them, when we have kids. My husband says to me often, “You’re going to be such a great mom.” It is so bittersweet to hear and finally just after Thanksgiving last year I decided, why wait? You see, I have all of these holidays traditions I invented (I am sure other people have done them, but they are not passed down to me from someone else) that I know I want to do with my own children. For Christmas, the tradition I began with my husband was placing a stuffed animal (that would mean something to him) in his arms as he slept, so he would wake up to it the next day. And I did. (Thank goodness he is such a heavy sleeper!) I always thought ‘Santa’ would do this for our kids. 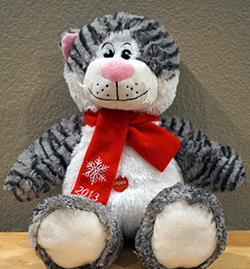 Each stuffed animal would mean something special to the child in question. Easter (yesterday) was the second opportunity I have had to flex my child-wanting trial holiday traditions. I always thought that the night of Easter my children would leave carrots and some water for the Easter Bunny (we did not do this, since this was all of a surprise for my husband) and then when they woke up they would find said carrots gone with a thank-you note from the Easter Bunny (also did not do). I did do everything that would follow though. First there would be the great Easter Basket hunt. Next would be a hunt for Easter eggs filled with all kinds of candy and a few special eggs with change: pennies, nickels, dimes and quarters. (Of course, if my children are going to be anything like me, they’ll learn what the change sounds like and if each child is only allowed to get ‘x’ number of eggs, they’ll only collect the ones they believe has money inside. For this reason, when they get to this age, I see myself color coding or redistributing the small amounts of money they find so no one is shorted. Always, thinking ahead…) Lunch would be the special meal for Easter, or it would really be more of a ‘Linner’ (lunch/dinner) and the rest of the day would just be family fun time, activities or just mellow quality time at home. My husband, Roy, had no idea what I was up to. For me, the fun was in the surprise. Rather than tell him the traditions I want us to have with our kids, I would much rather show him. Since it is just us, Roy is still acclimating to a new job and everything else that has been going on in the background I knew that he had no intentions of doing anything for Easter. So, for the past eight weeks (who could ever think I am a planner?) I have plotted, collected, secretly purchased and stashed away, Easter baskets, candy and colorful plastic eggs, biding my time. It is also fortunate for me that in addition to being a heavy sleeper, Roy is also not a morning person (but I am!) 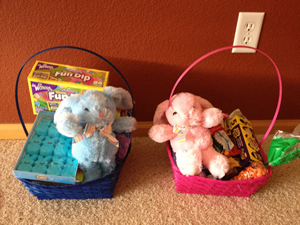 so I was able to assemble our baskets, fill the eggs and execute every detail. Our baskets are nice enough and will do until we have kids, but I am hoping to make our own or work with someone to completely customize our baskets so they each have a personal touch to them. I intend to have one made for each of our future kids (because it is not a question of if so much as when). I made sure to get myself a basket, because I knew my husband would feel bad that he didn’t do anything, so I took certain measures to take care of these feelings and focus on the happy. I filled my basket with a lot of my favorite treats, some of which were things he had randomly picked up for me in the last few weeks. His basket was filled with his favorites (too many Peeps to count and a 1LB Reese’s Chocolate Bunny, not hollow). I left him a note he was bound to find when he checked the time, telling him to get dressed, come downstairs and find his basketcase of a spouse. “Find your basket” was underlined, and as soon as he came down I handed him his coffee (again, he is not a morning person, but I was ready). He found my basket first; it took him about fifteen minutes to find his own. It was hidden under a table in our living room. 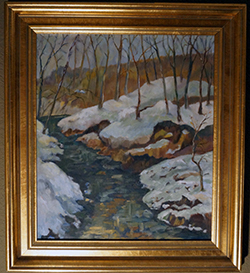 Why it mattered: above the table hangs one of two pictures that his late grandmother, Rachel, painted. I never had the opportunity to meet her, but everyone in his family tells me we would have gotten on famously. (She had always wanted to be a redhead, was an English professor who treasured books above most other material possessions, and our ‘take no crap’ and speak our mind personalities, well… you see where this is going.) Roy was very close with Rachel and has told me many times that he believes Rachel led him to me, since he stumbled upon me, quite by accident, all those years ago. I don’t believe in fate or destiny, but I always smile at this thought. After he found his basket, it was time for the egg hunt (I did not know this until today, but apparently Rachel loved having egg hunts). 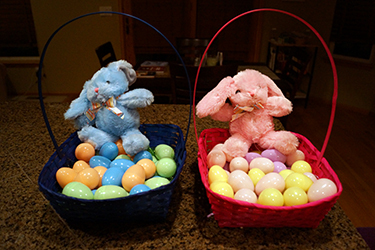 I had carefully hidden 36 eggs on the main level of our house. ME: No, the Easter Bunny is terrified of heights. Such talk continued and whenever Roy found an egg, I made a big to do about it, and it was completely sincere. I was having a great time, creating memories and traditions to have in place when we have a little one (or two, or ten) to share these experiences with. ME: Oh my, is that a quarter? You’re going to be a rich man! (Roy laughs) Roy: You are going to be such a good mom. This probably sounds crazy, and maybe it sounds like my husband is being an enabler of my crazy, but today really was a great day because of traditions, perhaps premature, but I see them as a trial run sort of thing. Make them now and make them happy, and then include our kids when they come along and we have already worked out the kinks. Dyeing eggs and having the egg hunt outside will be things we’ll do when we have kids who are old enough to partake in an egg hunt. (It was beautiful outside, but I thought if the neighbors saw my husband searching for eggs and me carrying on with the camera, well it would be a bit too much.) Another thing I did to make sure Roy didn’t feel bad was include him in on the fun. After his egg hunt, he was able to fill and hide eggs for me to find. I had purchased 144, and his colors were blue, green and orange while I left pink, purple and yellow eggs for him to hide for me. Afterwards, Roy took me to Red Lobster. When we have kids it will strictly be home cooked food, but I couldn’t plan anything because this was a surprise and I was exhausted anyway. (Hey, I may be good at being sneaky, but it takes energy.) Then Roy and I just lounged around, enjoying being together while doing our own things. I am grateful Roy saw all of this as thoughtful and not a desperate cry for help. He seemed to enjoy everything as much as I did and even gave me a card after I had found all of my eggs that he had written while I was reading in our room so he could go about hiding everything. I guess he had a feeling a few weeks ago that he would be needing a card 😉 . It wasn’t a ‘I’m in the doghouse’ kind of love card, but something sweet just because. He said he was waiting for the right time to give it to me, and today was the right time. I wonder if anyone else who is childless, but wishing they weren’t, considers what they would do on the holidays, when they have kids of their own. Maybe it is because I am a planner or maybe I just want kids so much, but I think that anyone who wants children as much as I do, totally thinks about these kinds of things. Now, do they actually act on them and make their husband fill in for said children – I don’t know. But that is all he is doing, filling in. I hope someday (sooner rather than later) we figure it out and have the brood I know we were meant to have. I am the oldest of five, but I come from a large Irish family and five kids is below average in terms of how many siblings my cousins have. Roy is the oldest of three. Roy wants two or three children and I want ten. I will probably compromise and settle for four to six. I know this sounds crazy for someone who doesn’t even have one kid yet, but even my friends who are all set with one or two kids remark I am going to be one of those moms like Lynette from Desperate Housewives. You know the kind who is ‘big picture’ but still detailed-oriented, does not sleep or get sick and is so organized it is scary. And like Lynette, I also plan to have my career to boot (but I have my own business and hope to be a full-time writer soon, so at least I have that going for me). As one of my mommy friends remarked “You are more Monica Gellar than Monica Gellar”. It just dawned on that on the show Friends, Monica also struggled with having children – just made that connection. Every personality test, ridiculous family quiz or other psychological inventory tells me I was meant to have a large family. Maybe it is because I took care of my four siblings, most of whom are more than ten years younger than me, while I was still a kid. Feedings, homework, many firsts, putting them to bed… I can do a big family. There is nothing that matters more to me than my family, both present and future. So, that was my Easter. How was yours? This entry was posted in Family, Holidays, home, Life, Love, Parenting, Personal, Relationships and tagged "creating traditions", "Easter basket", "Easter eggs", "egg hunt", "family planning", "holiday traditions", "want kids", childless, children, Easter, holiday, kids, surprise, traditions. Bookmark the permalink. I think that this is an awesome idea! Love that you are planning for what you know will come. Takes a lot of faith and hope something so many dont have. We live in a society that says I cant so I won’t instead of preparing themselves for that moment it does happen. Which will leave you totally unprepared. Im single so im probably not going to go through as much to dob it but thinkbthats a good idea to at least consider an jot down some thoughts and ideas for when the time does comes.